Prayer comes very close to being a basic human instinct. When one is in a life-threatening danger, the inclination is to pray. When the sorrows of human existence come crashing in and the heart is crushed under the burden, one can scarcely restrain himself from calling out for help — even when no discernable person is present. When one is heavily burdened under the weight of his own guilt, and recognizes he is powerless to find refreshment, he can’t help crying for help—if he has a fragment of conscience remaining. We innately feel that there must be someone who hears us, understands our plight, and is capable of rendering some response that could alleviate the pain. Surely the Bible student cannot but be impressed with the importance of prayer in the life of Jesus Christ. No less than fourteen times in the Gospel narratives mention is made of the prayers of our Lord, with the greatest concentration in Luke’s narrative. This has led some to characterize the third Gospel as the “Gospel of prayer.” This mightily underscores the humanity of the Savior. If one follows the common logical line of reasoning called a fortiori (from what is less likely to be the case, to that which is more probable) a compelling argument can be made for the urgency of prayer in the Christian’s life. If Jesus, the perfect Son of God, saw the need for prayer in his life, how much more ought we? Christ’s ministry, from the day of his baptism to the hour of his death, was saturated with prayer. The Lord prayed for himself (Matthew 26:39), for his disciples as a group (John 17:6-19), for them personally (Luke 22:31-32), for the church of the future (which includes me! – John 17:20-26), and even for his enemies (Luke 23:34). Little wonder, then, when he had finished a period of private prayer one day, a disciple requested: “Lord, teach us how to pray” (Luke 11:1). Alfred Plummer’s essay on “Prayer” would pay rich dividends to the student who is able to avail himself of the material (Hastings 1909, 390-393). A rather common view seems to be that one can pray any way he wishes—off the cuff, so to speak—with no restrictions or guidelines of any sort required. Not even that unnamed disciple was so naive, for he acknowledged that the proper procedures for prayer must be taught. James, the half-brother of the Lord, emphatically stated: “You ask, and receive not, because you ask amiss” (James 4:3). “Amiss” has to do with that which is wrong or wicked; in this case it involved an improper motive. This does not mean that there is a rigid format that must be in place in every situation, or else God will not hear. He is intimately familiar with our awkward stumblings and lack of discipline. I am suggesting there are certain guidelines that must be operative if our prayers are to be as effective as we desire. 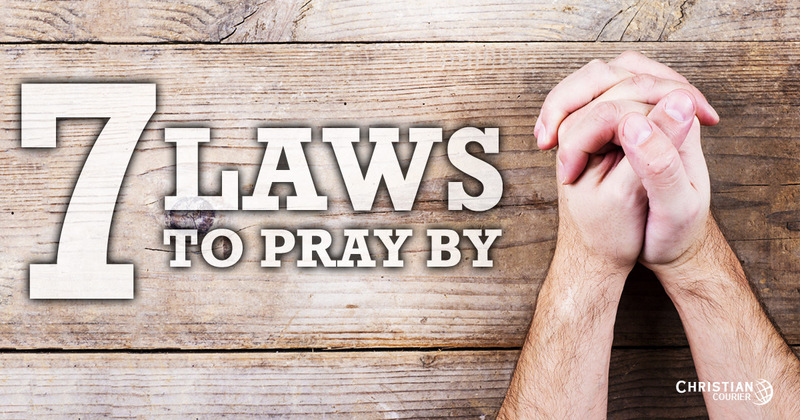 In this brief article I wish to call attention to what I will classify as “Laws Regulating Prayer.” This list may not be exhaustive; it is, however, extremely important. Jesus taught his disciples to pray, “Our father in heaven” (Matthew 6:9). This phrase assumes a father/child relationship. Prayer is designed to be a mental or verbal contact between one who has entered into a covenant relationship with God, accepting him as a Father who has paternal authority, and who loves and blesses his people as children. According to the Lord’s teaching elsewhere, that relationship is achieved by means of a process that is expressed metaphorically as being “born again” (John 3:3-5). This event takes place when one accesses and understands the basic facts about Christ and his atoning death, and responds in obedience to the sacred plan for obtaining forgiveness of all past sins (Galatians 3:26-27). See our article elsewhere on The New Birth. Prayer is a special privilege for those who are “in Christ” (John 15:7; Ephesians 1:3). The Creator views the prayers of those who deliberately turn away from his law as an abomination (Proverbs 28:9). The ears of the Lord are open to the supplications of the righteous, but his face is against them who pursue evil (1 Peter 3:12). This is not to suggest that God might not respond to the sincere longings (reflected in prayer sentiments) of those who are of honest hearts, and are searching for the truth. The prayers of the noble centurion, Cornelius, were “heard” (Acts 10:31; cf. v. 4), and Providence saw to it that he was exposed to the gospel and was given opportunity to obey, thus receiving pardon (11:14; cf. 10:48). But he was not permitted to detour around Heaven’s plan of redemption. Surely the mysterious “man of Macedonia” in Paul’s vision (Acts 16:9) represented the prayerful desires of sincere souls in that region who sought to know Heaven’s saving truth (see 16:13-15,23-34). These situations, however, do not nullify the need to become a child of God through contrite obedience; they confirm it. There are those who see no real need to pray. After all, they contend, God knows his people’s hearts. Why is it necessary to verbalize them? The simple answer is this: because he commands such. Jesus himself declared that the “Father knows what things you have need of, before you ask” (Matthew 6:8). Nevertheless, he charged his disciples to: “Ask” (Matthew 7:7). The inspired James affirmed: “[Y]ou have not, because you ask not” (James 4:2). Prayer is an act of faith; if one cannot exert the effort to communicate with his Creator, can he really complain when blessings are withheld? Pity the blighted soul who is not on speaking terms with the God of heaven and earth—or refuses to be! How would one feel if approached by a friend who said: “I really doubt this will do any good—since you are known to be stingy—but could you help me with a loan?” That is the disposition some of the Lord’s people have with reference to prayer. They don’t believe that petitioning God will accomplish much, but they will go through the motion anyhow. James addresses this lack of confidence in the goodness and ability of the Lord. But if any of you lacks wisdom, let him ask of God, who gives to all generously and reproaches not; and it shall be given him. But let him ask in faith [trust, confidence], nothing doubting: for he who doubts is like the surge of the sea driven by the wind and tossed. For let not that man think that he shall receive anything from the Lord: a double-minded man, unstable in all his ways (1:5-8; cf. Matthew 17:19-20). We are realistic enough to admit that we don’t always know what is best for us (Romans 8:26), but we can be absolutely confident that God will (or will not) respond to our prayers—consistent with our genuine spiritual needs (cf. 2 Corinthians 12:8-10). Some appear to entertain the notion that prayer is a tool to be utilized mostly when an emergency arises. But God is not a sort of watchdog entity, to be thrown a few crumbs from time to time, and kept on call until such time as a crisis arises. And yet not infrequently he is treated in precisely this way. At other times, some have very little to say to the Lord. Not a few neglect to offer their gratitude even at meal times. In his first epistle to the Christians in Thessalonica, Paul charges: “Pray without ceasing” (5:17). The verb “pray” is in the imperative mood (a command) and present tense. The verbal tense, along with the adverb rendered “without ceasing,” denote a steadfast practice of prayer—not an uninterrupted, all-day-and-night prayer, which of course would involve an impossibility (cf. Romans 1:9; 1 Thessalonians 1:2-3). The idea of the present imperative is not that believers are to pray every minute of every day, but that we should offer prayers to God repeatedly. We should make it our habit to be in the presence of God (Wallace 1996, 521). In the parable of “the friend at midnight” (Luke 11:5-10), Christ illustrated the concept of persistency in prayer by telling of a man whose neighbor came calling late one night, asking for food with which to feed an unexpected guest. But the man, having already retired, did not wish to be bothered, hence, refused the request initially. But the friend would not be deterred; he kept knocking. Accordingly, as a result of the “importunity” (v. 8, ASV) of the late-night visitor, the host arose and provided him with what he needed. The term “importunity” suggests the idea of asking to the point of shameless continuity. With three verbs, each in the present tense, Jesus emphasizes: keep on asking, seeking, and knocking, and you will receive. The point was this: if a grouchy neighbor can be goaded into action, surely a loving Father will delight in responding when his dear children persist in prayer. Compare a similar parable in Luke 18:1ff, where the lesson is stated specifically: God’s children “ought always to pray, and not to lose heart” (v. 1). The Christian must keep his “praying muscle” exercised! “To neglect this privilege is one of the greatest of sins” (Jones 1961, 58). If you abide in me, and my words abide in you, ask whatever you will, and it shall be done unto you (John 15:7). In this passage the effectiveness of prayer is made dependent upon two conditions. First, the petitioner must be “in” Christ, and remain steadfastly in that relationship. Second, the Lord’s teaching must be resident in the heart of that person. The power of prayer is promised neither to the drifter, nor the superficial disciple (cf. 1 John 3:22). Similarly, James wrote that the “supplication of a righteous” person “avails much in its working” (5:16). What does that say regarding the petition of the worldly individual? [T]he eyes of the Lord are upon the righteous, and his ears unto their supplication; but the face of the Lord is against them who do evil (1 Peter 3:12). An old saying, “A dancing foot and a praying knee do not grow on the same leg,” contains a ton of truth. The “lifting up holy hands” is more than likely an expression borrowed from the Old Testament because of a common (though not fixed) ancient practice of raising hands when praying (see 1 Kings 8:22; Psalm 28:2; Isaiah 1:15). There is, however, literally speaking, no such thing as “holy hands.” This is a figure of speech known as the synecdoche (the part put for the whole); “holy hands” stand for a holy person (cf. the body parts mentioned in Proverbs 6:16-19). Many seem to entertain the notion that they are permitted to pray for anything and everything. Supposedly, there are no limitations. The apostle John emphatically instructs otherwise: “If we ask anything according to his will, he hears us” (1 John 5:14). As if to punctuate the point further, in the following narrative the apostle observes how useless it is to pray for those who sin the sin that is “unto death” (v. 16)—which apparently is a sin (any sin) pursued with such absolute determination that there is utterly no inclination to change. To petition God for forgiveness on behalf of such a one, while ignoring the person’s rebellious spirit, is futile. One is not to pray for God to perform a miracle, e.g., reducing his age by twenty years, or raising from the dead his long-deceased spouse, for such events would require a miracle, and the age of miracles was terminated near the end of the first century (see our article elsewhere on Miracles). One may not expect an answer to prayer if he prays to or through Mary, or one of the other ancient holy people of God. One may not pray for the salvation of those who have died lost. One may not petition the Lord to circumvent his plan of redemption in the interest of some family member who repudiates Christ as Savior, or despises the gospel system. Our prayers must be compatible with the teaching of Scripture. Our hearts throb with the challenge of emulating our Lord who, while suspended on the cross, prayed: “Father, forgive them, for they know not what they do” (Luke 23:34). It defies the ability of any writer to describe the breathtaking magnificence of this prayer of only eight words in the Greek text. The prayer reveals an absolute divesting of all self-interest on the part of the Savior. Tortured in the most agonizing manner possible, ridiculed by a blood-thirsty mob, forsaken by most of his apostles, and separated even from his loving Father (by God’s permissive will in implementing the plan of a perfect sacrifice for salvation—Matthew 27:46), at this crisis moment he thought only of others. He longed desperately for the redemption of the vilest of creatures. Greater love has never been demonstrated. besought a last chance for the guilty people. And the Father, who is One with the Son in long-suffering and love, heard the prayer of the Savior. After the people of Jerusalem had tempted heaven by casting out Jesus in this manner and causing Him to be crucified, the Father, who is also the God of history, gave them for another forty long years the opportunity, through the mighty signs of Pentecost and the ministry of the apostles and other believers, to repent in time and to be saved. Several thousands made use of this period of grace and were saved, but the majority were in their folly precipitated into the abyss (Geldenhuys 1956, 609). The manner in which they were pardoned is simply set forth in Acts 2:37-42. Professor Robert Stein has insightfully commented that “Jesus’ prayer clearly makes any attempt to justify anti-Semitism on the basis of the crucifixion impossible” (1992, 589). How long has it been since you prayed “for them that persecute you” (Matthew 5:44)? I recently reflected upon this matter and concluded that my prayers in this regard were long overdue. I proceeded immediately to remedy that neglect. It has not been our intention to approach the thrilling theme of prayer in a legalistic fashion—as some might be prone to charge. But rather to simply call attention to the fact that Scripture itself emphasizes divinely directed guidelines to effective prayer. Surely every conscientious Bible student wishes to respect the will of God in this matter, as in all others. Geldenhuys, Norval. 1956. Commentary on the Gospel of Luke. Grand Rapids, MI: Eerdmans. Hastings, James, ed. 1909. A Dictionary of Christ and the Gospels. Vol. 2. Edinburgh, Scotland: T.&T. Clark. Jackson, Wayne. 2007. Before I Die – Paul’s Letters to Timothy and Titus. Stockton, CA: Courier Publications. Jones, Russell Bradley. 1961. Proclaiming the New Testament – The Epistles of James, John, and Jude. Grand Rapids, MI: Baker. Stein, Robert. 1992. Luke – The New American Commentary. Nashville, TN: Broadman. Wallace, Daniel. 1996. Greek Grammar Beyond the Basics. Grand Rapids, MI: Zondervan.